Christian Winchell, 24, describes parkour as “interacting with the environment with your body.” As a coach at Steel City Parkour in Export, Pa., he practices this almost every day to maximize his potential in this sport. Steel City Parkour, which opened in November 2014, is a gym that was created to teach the activity of free running, also known as parkour. Steve DiGirolamo, 25, is the owner and head coach of the gym. He said there are members that are as young as five and as old as mid-fifties honing their parkour skills. “A lot of people come in for Ninja Warrior, and they try it and it’s really disappointing for them because they can’t do any of the obstacles,” DiGirolamo said explaining how real parkour differs from entertainment. The Steel City Parkour Gym teaches classes in parkour, where students of all ages can also participate in open gym. They can practice techniques and tricks freely for use in a real-world environment, which is the ultimate goal of learning the moves. What would eventually become his career and lifestyle started out simply as a childhood distraction for DiGirolamo, who discovered parkour in high school after he had already been doing stunts on a trampoline as a kid. It was only after he had already been learning tricks that a friend showed him videos of parkour stunts. After high school, he began a parkour club at one of Penn State University’s branch campuses, where he majored in business. That is also around the time he first became a parkour instructor at a gymnastics gym, and he had only been doing parkour for about a year. DiGirolamo decided he wanted to own his own parkour gym after he noticed there were not many spaces where people could learn parkour in Western Pennsylvania. He realized he could turn it into a profitable business after visiting other parkour gyms – Tempest Freerunning Academy in Southern California and Apex Movement in Colorado. With four years of parkour teaching under his belt by 2014, DiGirolamo bought a former gymnastics gym on Borland Farm Road and turned it into his own parkour gym. When Steel City Parkour opened, it was the only true parkour gym on the eastern side of the United States, DiGirolamo said. Even now, the nearest parkour gym to Pittsburgh is in Baltimore. “I had to get in on it right away,” DiGirolamo said about joining the parkour gym revolution. On a Sunday afternoon in October, DiGirolamo and Winchell drove to Mount Lebanon Park, so they could perform parkour maneuvers on the suburban area’s structures. Along with teaching and doing parkour in their own gym, they like to take their talents to the streets. 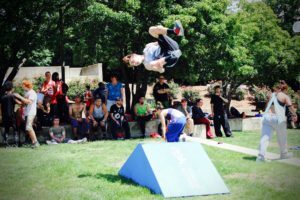 Weather permitting, DiGirolamo and other people he trains with try to practice their parkour skills in an outside environment as much as possible. They go to areas in Downtown Pittsburgh, local parks and also the University of Pittsburgh’s campus. As Winchell prepared for a jump, he cleared pebbles off a stone wall with his hands to ensure he does not slip when he lands on it. “If I hit those rocks, it’s going to be like sliding on a banana peel,” Winchell said. DiGirolamo said he rarely gets nervous about performing a maneuver. He also said he has gotten hurt more times in the gym than outside. “Pads give you a false sense of safety,” DiGirolamo said. 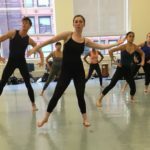 The most serious injury any of his students have suffered is a sprained ankle, DiGirolamo said. And usually they do not injure themselves while performing a trick. DiGirolamo emphasizes to his students that it is imperative to know their limits. “Know what you do,” DiGirolamo says to his students. Some kids will come to the gym upon a friend’s recommendation. Once they see what their experienced friends can do, they will try to do emulate them. “‘Just because your friend can do it, doesn’t mean you can do it,’” DiGirolamo says to kids. Steel City Parkour offers beginning, intermediate and advanced classes. These are structured classes in which the instructors have control. Once a student has performed well in class, DiGirolamo suggests they attend open gym. That is a time period where students can practice moves at their own will, while the instructors observe and give them tips for improvement. “They can do anything in here that they want,” DiGirolamo said. DiGirolamo views parkour as an art form, not a sport – which is what he tells his students. DiGirolamo said most of his students perform best at open gym, where they have creative freedom, which he believes is important. He said that is where parkour training differs from gymnastics. Gymnasts come to Steel City Parkour and they are in awe of the possibilities for tricks, although, DiGirolamo said that he will usually see the gymnasts just standing around awaiting instruction. DiGirolamo said he will ask students why they aren’t doing anything. “‘Well, nobody told me what to do; I don’t know what to do,’” DiGirolamo says that is how they usually respond. Once DiGirolamo proposes a move for them to perform, they will continuously practice it until they receive further guidance from him. DiGirolamo said gymnastics coaches tell kids what do at all times, depriving them of any input or control. It is important to him that his students express themselves and have independent thoughts. “They shouldn’t just rely on us,” DiGirolamo said. Charity McBride’s son Elijah was growing tired of the stress from doing gymnastics, so he wanted to come to Steel City Parkour. Abigail Beam, 12, has been going to Steel City Parkour since April. She is also a gymnast but says parkour is “a little more advanced” than gymnastics. “It’s really fun,” Beam said. Additionally, DiGirolamo said that many kids who attend their classes and open gym don’t enjoy team sports. YouTube and Instagram have contributed to parkour’s popularity, and DiGirolamo said that helps attract kids to his gym. “Kids will see [parkour videos] on YouTube or Instagram, and they’ll say, ‘Oh, I want to do this,’” DiGirolamo said. Coaches at the gym also post videos of their own stunts on Instagram and YouTube, adding to the growing number of parkour videos currently on the Internet. DiGirolamo said that learning parkour has made some of his students more confident in themselves. “I get kids who come in here who are afraid to talk to people; they’re afraid to do anything,” DiGirolamo said. But once they learn how to do a few tricks, it makes them feel better about themselves, which crosses over to other aspects of their lives. Some parents have told DiGirolamo that their children have improved their grades and that they have become more social since joining his gym.